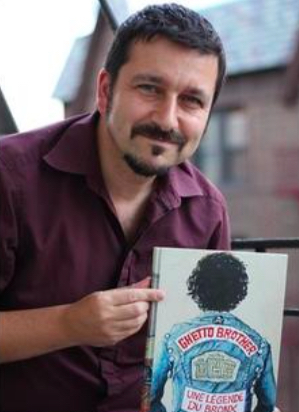 The Manny Cantor Center presents Ghetto Brother: Warrior to Peacemaker, a book discussion by Julian Voloj. Mr. Voloj will be present to discuss his work and sign books. An engrossing and counter view of one of the most dangerous elements of American urban history, this graphic novel tells the true story of Benjy Melendez, a Bronx legend, son of Puerto-Rican immigrants, who founded, at the end of the 1960s, the notorious Ghetto Brothers gang. From the seemingly bombed-out ravages wracked by drugs, poverty, and violence, he managed to extract an incredibly positive energy from this riot ridden era: his multiracial gang promoted peace rather than violence. After initiating a gang truce, the Ghetto Brothers held weekly concerts on the streets or in abandoned buildings, which fostered the emergence of hip-hop. Melendez also began to reclaim his Jewish roots after learning about his family’s dramatic crypto-Jewish background. German-born photographer and writer Julian Voloj explores identity and heritage in his work. He has been featured in a variety of newspapers and magazines such as The New York Times, the Washington Post, and the Jerusalem Post. His award-winning work has been exhibited in museums and galleries around the globe including the Deutsch- Historisches Museum (Berlin), the Bronfman Center at NYU, and the Queens Museum of Arts (New York). In 2012, the German Consulate, New York, showed a ten-year retrospective of his photography titled “Only in New York.” In 2010, he photographed the former gang leader and Crypto-Jew Benjamin Melendez. The two became friends and Julian decided to turn his life into a graphic novel, Ghetto Brother. The book, illustrated by Claudia Ahlering, has been published in English, Spanish, German, French, and Portuguese.